Samsung is reportedly readying another "world's first" for next week's MWC 2014 conference in Barcelona, this time by premiering the world's first flexible tablet. The South Korean electronics giant may show off a new tablet that can be bent to a right angle, according to Chinese-language site etnews citing "the industry." The unconfirmed tablet PC, which the site calls a "Ben Double Tablet PC," could make use of patents that Samsung has previously filed for flexible displays up to 90 degrees. The report is tenuous, but Samsung is no stranger to curving and bendable devices. Last month, the company took to CES 2014 to show off multiple displays that exhibited such flexible technology. Many of Samsung's "world's firsts" can be seen at an angle, including its bendable TV and 105-inch curved Ultra HD 4K TV. The Samsung Galaxy Round was also a world's first sporting a gentle concave curve to its screen. It hasn't been seen outside of South Korea, though. The experiment-happy company isn't likely to continue the trend in its imminent Samsung Galaxy S5 phone. There's also no curve to the flat-as-can-be Samsung Galaxy Note Pro 12.2 and Galaxy Tab Pro 12.2, but they're the first Android tablets to feature a 12-inch display. 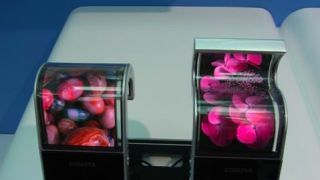 Samsung has shown off concepts of flexible OLED tablet displays in years past, but this year, we could actually see a real product emerge.